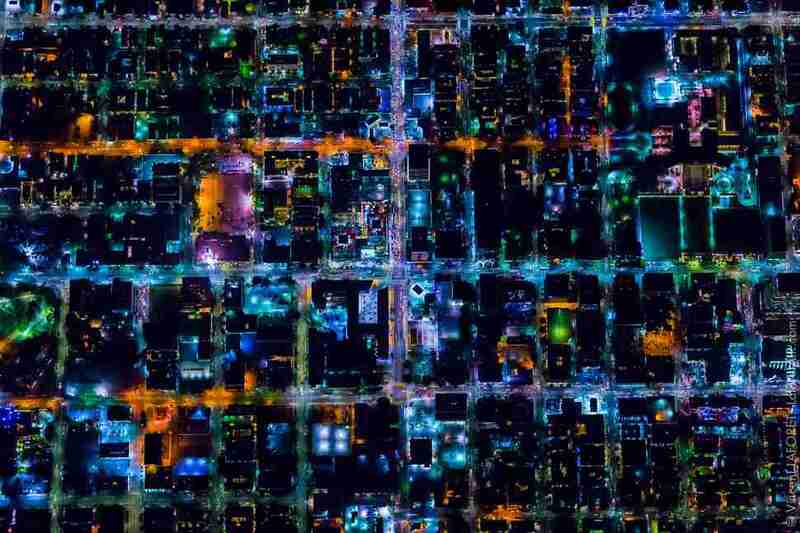 Since you probably spend most of your time admiring the hills upon hills of urban sprawl that is Los Angeles from the comfort of your traffic, you'd think that photos of the city from high above at night would be anything but peaceful, but that's what a new collection of incredible aerial photos by award-winning photographer Vincent Laforet somehow captures -- a dazzling, peaceful Los Angeles from 10,000ft in the air. Laforet, or the aerial photography extraordinaire who previously brought us stunning photos of New York City, San Francisco, and Las Vegas from several thousand feet above, set out in January and again in March to capture the essence of Los Angeles while dangling out the side of a helicopter, and the resulting photos -- a handful of which you can see below -- will blow you away. "The truth is, LA is very chaotic visually -- it's not a perfect grid and there are streets that cut through it all the time and it's hard to find these perfect compositions," Laforet said. 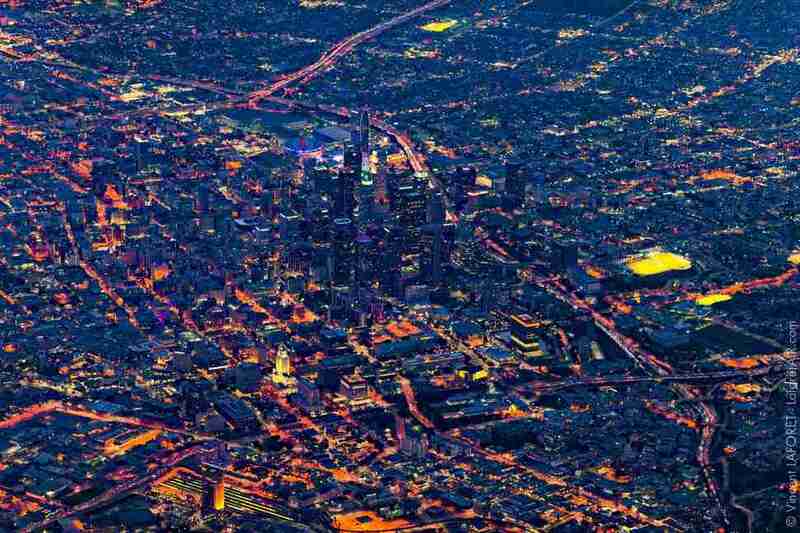 "At the same time, the weird thing about LA is that it’s by far the most peaceful city from above. It just feels peaceful and I think it has to do with the fact that it’s not that busy, and what I mean by that is the streets are not full of people like Manhattan, or Chicago where there are so many little lights and houses. It’s more spread out and mellow." 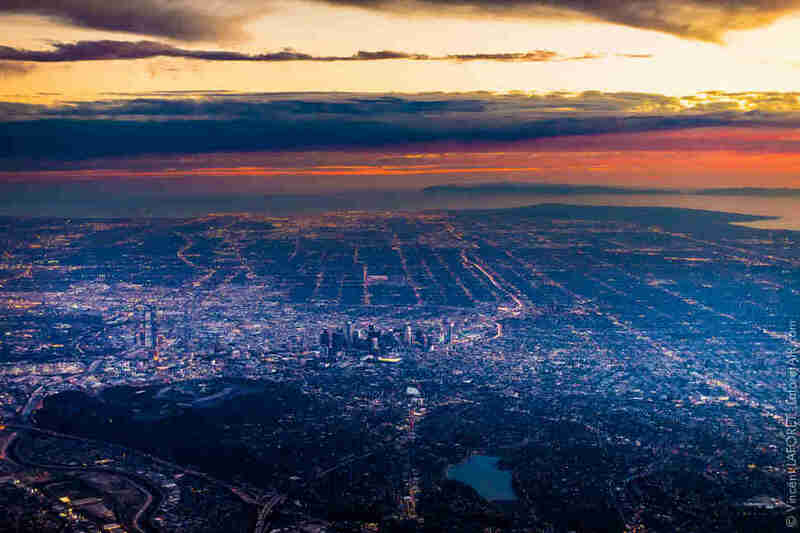 But unlike other cities with geographical borders or other boundaries, the sheer size of Los Angeles made it the most difficult city to photograph -- even from so high above, he said. "LA is the largest metropolitan landmass in the country," he said. "There is no real start or end and this is extremely intimidating for a photographer to find some sort of pattern or geometry in the city. The hardest thing in this series is to try to find what makes each city different and somehow catch the ethos of that city in some way, if you will. 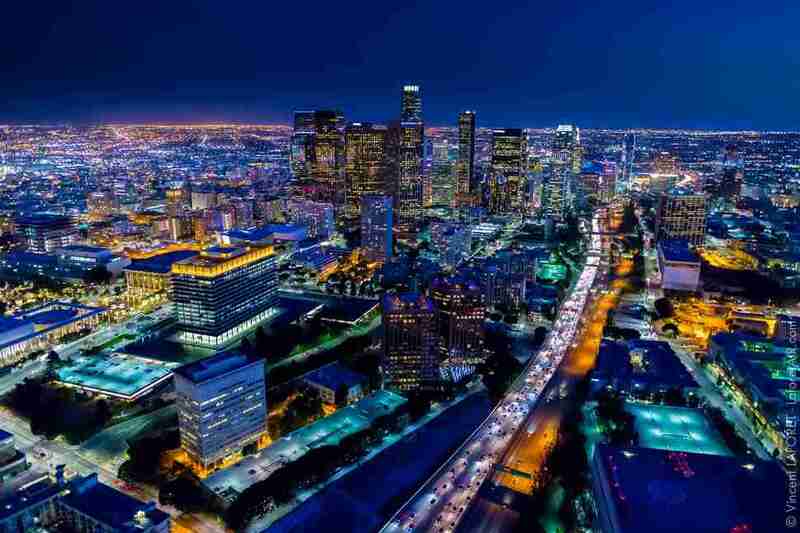 But with LA, you get up there and it's just never-ending." 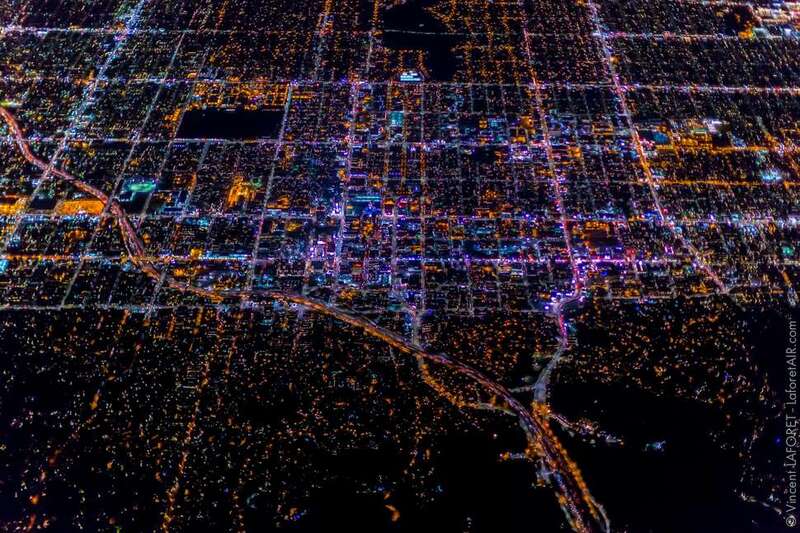 Despite the challenge, Laforet said he's confident that he captured a good variety of images that show the little things about Los Angeles; for example, a random street that appears to be illuminated by green fluorescent lights, in addition to the city's well-known hills and traffic. "Downtown is important for obvious reasons and the hills and the sprawl is important to me," he said. "And the really obvious one here is the traffic. Traffic is the one thing that instills the fear of god in people there. It defines the city." On top of releasing the new collection of photos, Laforet has announced that he has confirmed plans to photograph a string of several European cities next month, starting with London and then followed by Barcelona, Berlin, Paris, and Venice. There's a possibility that he'll also travel to Monaco. 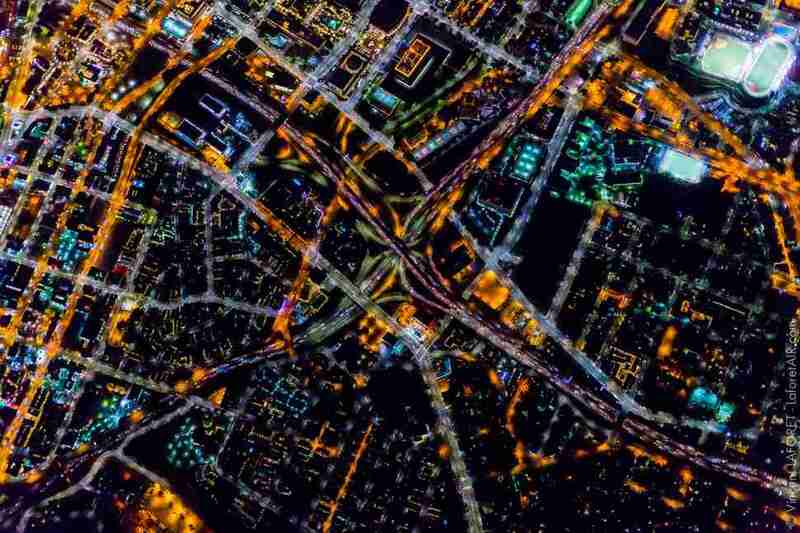 Throughout the European trip, Laforet said he and his team will invite locals to tell stories about their cities online and even invite a few of them up in the helicopters. He'll also make a several stops to meet people in each city and encourage them to meet each other, too, to build community, he said. Laforet said the shoots have been funded by his sponsor, G-Technology, as well as through pre-sales of his book of the photographs. Shooting each city costs as much of $40,000, and sometimes more, he said. You can check out the full set of the Los Angeles photos at Laforet's Storehouse site and pre-order his book of the Air series photos here. Tony Merevick is Cities News Editor at Thrillist and, unfortunately, only gets views like this on the rare occasions that he's traveling into a major city at night. Send news tips to tony@thrillist.com and follow him on Twitter @tonymerevick.